"Corn, black beans, cumin, and Monterey Jack cheese lend Southwestern flavor to these fried egg rolls. They're perfect for parties. Serve with salsa or ranch dressing, or combine equal amounts of salsa and ranch dressing for a different taste." Heat olive oil in a skillet over medium heat. Stir in onions, and cook until tender. Stir in spinach, corn, black beans, and lime juice. Season with salt and cumin. Remove from heat, and stir in cheese. Place 1/4 cup of filling in the center of each egg roll wrapper. Fold in the sides, and roll egg rolls; dampen the edges with a small amount of water to seal. In a large heavy skillet, heat enough vegetable oil to cover egg rolls over medium-high heat. Working in batches, carefully place egg rolls in hot oil, and cook until golden brown. Remove to paper towels. These delicious bites make an impressive brunch, dinner, or appetizer. These are great. My husband keeps telling me not to ever lose this recipe. I made a dip using a mashed avocado, 1/2 cup ranch dressing and 1/2 cup sour cream. Didn't have a great taste. 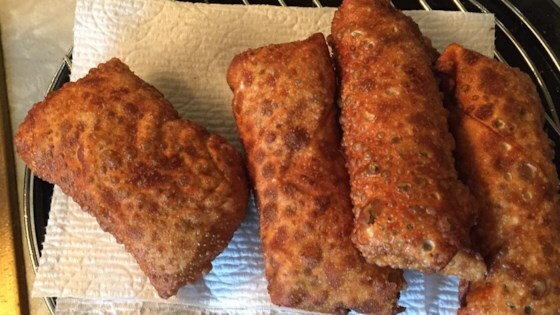 My kids love the eggrolls from Chili's but they tasted these and wouldn't eat them. I make these all the time and my family loves them. I usually double the recipe, add at least a cup of chicken and less spinach. I wrap the filling in tortillas and bake. YUM!! I would add a tad bit more cumin and maybe a dash of chili powder to give it more of a southwestern flair-definately a keeper! !